Francisco Goya (1746-1828) was one of Spain's greatest artists and his works have become a chronicle of Spanish history. By painting the aristocrats' idyllic lives in portraits, his paintings serve as a visual account of this important time in Spain's past. In 1792 however, at the height of his career, Goya contracted cholera with subsequent sequelae of paralysis, partial blindness, vertigo, tinnitus and eventual deafness. Gone were his colorful happy portraits, and what followed were new dark and macabre paintings. We can get a glimpse, possibly, into his psyche with his etching "?De que mal morira?" ("Of what illness will he die?") (1796-97). 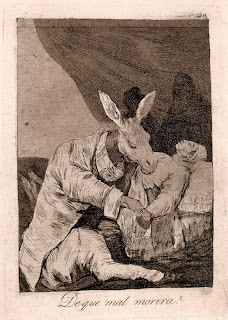 The physician depicted as a donkey in a suit may be how Goya viewed the medical community at the time. In the background we see the hooded figures waiting for this gentleman's death, while the physician can do nothing but take the man's pulse. Although Goya survived his illness, he was left permanently altered. Many believe he suffered an encephalopathy of sorts from the high fevers during his earlier illness causing a degree of madness. Most indicative of this dark period are the "Black Paintings", done at the age of 74, they are a series of 14 works done in fresco style on the walls of his house. The very method of painting on your own walls, implies a privateness to the pictures. They weren't painted to be viewed by anyone but the artist himself, as a kind of visual diary to the thoughts and images he was experiencing in his older age. In this series is "Two Old People Eating"(1820), these 2 men both pointing at who knows what, could have been Goya's only companions for his meals. The figure on the right is almost skeletal, and both seem to be taunting the artist. These next two pictures in the Black Paintings collection framed one of the doors downstairs, with "Two Old Men"(1820) on the left and "A Manola"(1820) on the right. 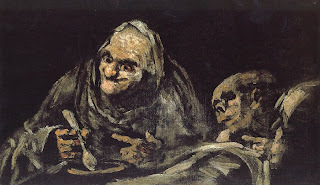 Here we see the possibility of Goya as an old man with the call of death being whispered in his ear. 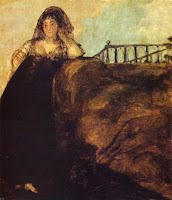 Whereas in the next scene the manola is in mourning clothes, resting on a grave- maybe Goya's? It says much to know Goya painted these on a doorway to which he was forever walking through. Perhaps reminding himself daily of his own mortality. Providing yet another glimpse into his world, Goya left us with "Self-portrait with Dr. Arrietta" (1820). Once again a commentary on the physician-patient relationship, this time the doctor offers compassion with his embrace and cup of kindness to the artist himself. The haunting figures are still present, but the doctor acts as a barrier of protection. The painting is inscribed on the bottom with "Goya in gratitude to his friend Arrieta for the skill and care with which he saved his life in his acute and dangerous illness suffered..."
Illness abruptly changed the nature of Goya's paintings, just as terminal illness changes the reality of our patients' lives. What images would we see depicted if our patients' narratives could be portrayed, like Goya, in works of art? For a look at more Goya paintings see the Black Paintings and a large collection at Olga's Gallery.